Let me tell you about us: Conceived in the fall of 2010, Timber Frame Headquarters was created to educate and bring folks together with a common goal; to spread the word about timber framing and provide a valuable online resource for everyone. We are achieving this goal by providing a showcase of timber frame house plans, a gallery, construction details and anything else we can think of. A timber frame sparks imagination and an emotional response from everyone that is a part of building the frame, to owners and to the future visitors to the timber frame space. On top of that emotional response, timber frames have added benefits of being energy efficient, handcrafted, and long lasting. We hope that this site helps inspire you to build a timber frame or give you the information you need to make your project go a little smoother. 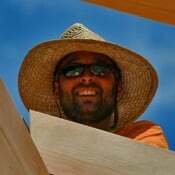 As Timber Frame HQ’s founder, I (Brice Cochran) have been working in the timber frame industry for ten years as a timber framer in the shop, project manager and designer. I am the proud father of two: Maddie and Liam. And I am happily married to my beautiful wife Christie. I have finished my own 3,000-square-foot timber frame home in SC while working in and on my timber frame design business, Whetstone Designs. We are also developing a team of contributors and editors to help spread the benefits of building a timber frame. If you are interested in being a part of this site, don’t hesitate to contact us for more information. The plans come via PDF so you get them as soon as you order them, let me know if you have any other questions. Do your plans include a cut list with all the locations of posts and beams? Most of the plans do, the only ones that don’t are the full house plans.